is a commercial and textile center in northwest Syria. An ancient city, it was part of the Hittite, Egyptian, Assyrian and Greek Empires before it was conquered by the Muslims in 638 A.D. After being sacked and besieged by Crusaders, Mongols and Huns, it was captured by the Turks in 1517 and was a flourishing trade center until the opening of the Suez Canal in 1869. 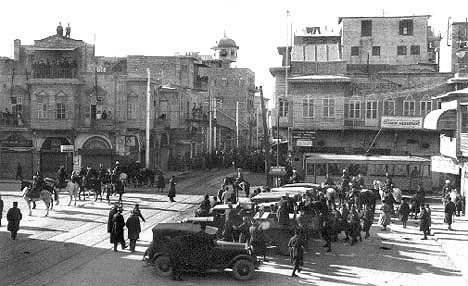 After British and Arab invasions in 1918, Aleppo became part of Syria by French Mandate in 1920. A meter-gauge tram system opened in 1929, eventually consisted of three routes, and closed in 1967. The postcard shows a tram at the central square. is located on the Barada River, with mountains to the west and desert to the east. The capital of Syria and arguably the oldest city in the world in continuous existence, Damascus is a great trade center famous for its bazaars, gardens and mosques. The city dates to the Egyptian and Hittite Empires and later was part of the Assyrian, Babylonian, Persian and Greek Empires. In 661 A.D. it became the residence of the Caliph and was frequently attacked during the Crusades. The French seized the city in 1920 and it became capital of Syria in 1925. 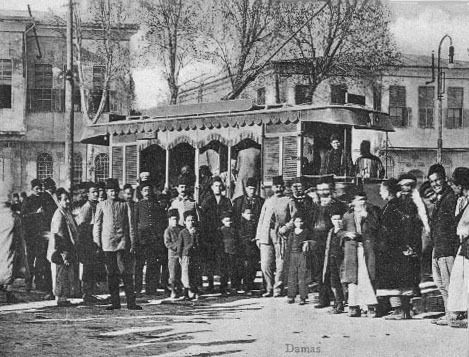 The postcard shows the inauguration of the tram system on February 7, 1907. The system used an odd 1050 mm gauge and eventually had 10 km of track and six routes, including a long suburban line to Douma. It closed in 1967.